I have hair issues. My hair is frizzy and thick yet fine. It grows super fast but when I don't use the straightener and let it dry naturally it losses about 8 inches. It's just as fickle and indecisive as I am. I've cut my hair three times throughout the past 10 years and it always grows back super slow until I start threatening it with another haircut. I've been leaning towards a bob cut in the past few weeks and made my appointment for this coming Saturday. I'm going to spend 3 hours getting a keratin treatment then will lose about 6 inches of hair. It's scary but I'm excited. To prepare for this I figured I'd straighten it myself one last time and really think about it. Do I really want short hair? I never really cut it unless I trying to start over and kill off all the dead ends and lose bad hair habits so lately I've been second guessing myself but I'm sticking to the plan and giving it the chop. 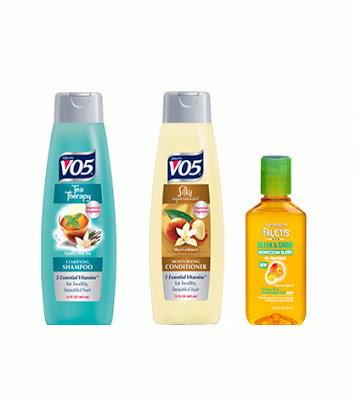 Being that I am frugal and always on the hunt for inexpensive yet wonderful things I discovered the wonders of VO5 products. I've always seen them at the drugstore but my hair always needed special treatment so I always opted for more specialized products. Clarifying shampoo was always scary because I didn't want anything to strip away the bit of moisture that my hair had but it works wonders for makeup brushes which is why I snatched up a bottle of it a few months ago. For $.99 I couldn't go wrong. My reason for owning the conditioner is because I was low on cash and wanted something moisturizing. The scent was also intriguing. I adore the scent of true vanilla and shea makes me melt. Together which the promise of being moisturizing and a good price I gave it a shot. Blow drying my hair always leaves me with a puffy mess. I do more harm than good and then straightening it is a mission. I finally developed method that works well for me and helps cut down on the pointless blow drying that happens when I don't have a keratin treatment. First I wash it with my VO5 Tea Therapy Clarifying Shampoo and Silky Experiences Moisturizing Conditioner. Leaving the conditioner on for about 10 minutes and sometimes stepping out of the shower and applying heat so that it could sink in a bit more. 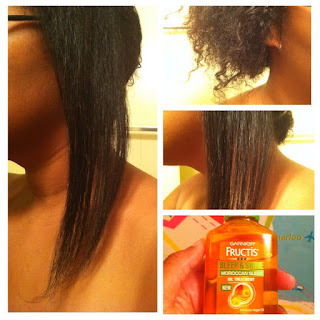 Last night I used Garnier's Moroccan Sleek Oil Treatment for the first time. This worked wonders and I really like how it soaked into my hair without leaving it greasy. I first learned about Moroccan oil when I was desperately needing a hair stylist in Manchester after a heatwave in mainland Europe and the wonderful people at Reuben Wood used it on me. after that I pull my hair back into a loose bun and blow dry it on medium heat. I call it advanced air drying. I don't want the heat to kill whatever moisture I've got in there. This can easily take 30 minutes so i just sit and watch Hulu. With my hair totally dry I then begin the straightening process. That can easily take an hour but because my hair was able to 'air dry' it's a bit less puffy, curlier and easier to separate in order to straighten. Below is some of the result from last night. I did a collage to show my friends the result of the Moroccan oil. I was surprised at the length even though there's about half an inch that would need to get cut regardless. My hair, when heat is applied a specific way, is always super silky and people are always surprised at the before and after, especially when it's a new person doing my hair. It really is like magic. What a difference straightening makes! I think I'm going to miss my hair. I spent so many years wishing for it to just get past my shoulders and when I washed it last night I felt a thick lump on my shoulder and it was my hair begging me to let it stay. Sadly, it won't. I'm starting my second year in LA in a few days and I want to start it fresh. Besides, it's only hair. It always grows back.